In December 2017 the RCN produced a third edition of its guidance Dignity in Health Care for People with Learning Disabilities. The document features contributions from an expert panel of people with learning disabilities, alongside examples of good practice. While mortality rates have improved over recent decades, people with a learning disability are still likely to die younger than others, with an average age of 65 for men and 63 for women, compared with 78 for men and 83 for women generally. According to NHS England, people with a learning disability are four times more likely than the general population to die of something that could have been prevented. The leading cause of death for those with a learning disability is respiratory disease. They are also more likely to develop mental health problems – in particular, schizophrenia has three times the average prevalence – alongside some cancers, diabetes, coronary heart disease and gastro-intestinal problems. About one-third have epilepsy. 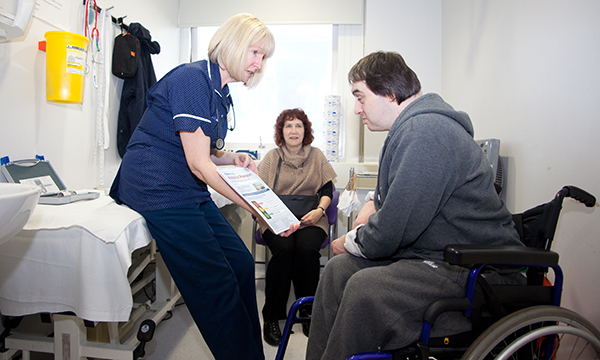 All healthcare professionals have a role to play in promoting the health of people with learning disabilities, says the RCN. Practical tips include booking double appointments to give them extra time to communicate their needs in a relaxed and less hurried way, while helping to alleviate anxieties. ‘This publication is essential reading for everyone working within health care, especially at a time when services are over-stretched and understaffed, with dignity often the first casualty. ‘Dignity is important when caring for anyone, but especially so for patients with a learning disability. They will have individual and different needs and can struggle to communicate these, often relying on support from others. But this means it can be all too easy to fall into the trap of directing communication and attention to a person’s carer, rather than interacting with them directly.